I have always been a fan of Lalaloopsy ever since I first saw her. So when I got offered a style and swap set to review I was super excited to see what the sets were all about. Lily owns a few of the middle sized Lalaloopsy dolls and she loves them, but I knew that the style and swap dolls may be a little small for her to play with yet. The set arrived and it was bigger than I expected. It came with 2 really cute mini Lalaloopsy's inside and a mixture of outfits. The 2 lalaloopsy's are named Sand E Starfish and Coral Sea Shells. It also came in a plastic zip up case that can be used to store your lalaloopsy's in. I think this is great and it really makes me want to collect them and fill it up with these tiny dolls. The selection of clothing is lovely. All so colourful and fancy with lots of detail. There are also 4 different hair styles to put on your Lalaloopsy's. It comes with 5 dresses, robe, and a swimming costume. It also comes with 3 sets of shoes for them, 2 mermaid tails a bag and treasure chest. The tiny shoes that come with the set are really really tiny. You would have to take really good care to not loose them. The idea is that you can dress up your Lalaloopsy's how ever you like, making a different outfit each time. There are 120 different ways you can mix and match up the outfits. So I dressed the first LalaLoopsy. They are really easy to dress but very fiddly. I would suggest that these toys be bought for a child with patience as it can take a little concentration to get the tiny outfits on them. Lalaloopsys heads wobble and there legs and arms flop around too. Just like a real dolly does. I placed a blue hair style, pink dress and tiny roller skates on the first Lalaloopsy. She looked so cute! 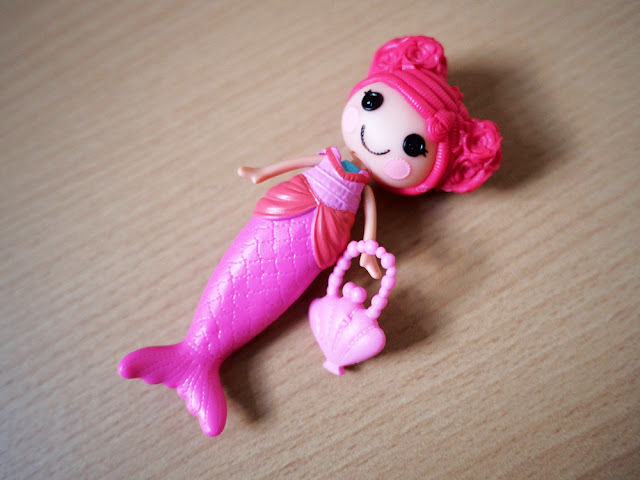 I then changed the Lalaloopsy and decided to give her pink hair to and place a mermaid tail on. I also gave her a little bag. All the clothing is made from a rubbery material which is soft and squishy. The Lalaloopsy's are a lot tinier than I thought. I placed one on my hand so you can see the comparison. Aimed at children 4+ they are definetly not for smaller children as the small pieces could be a choking risk. 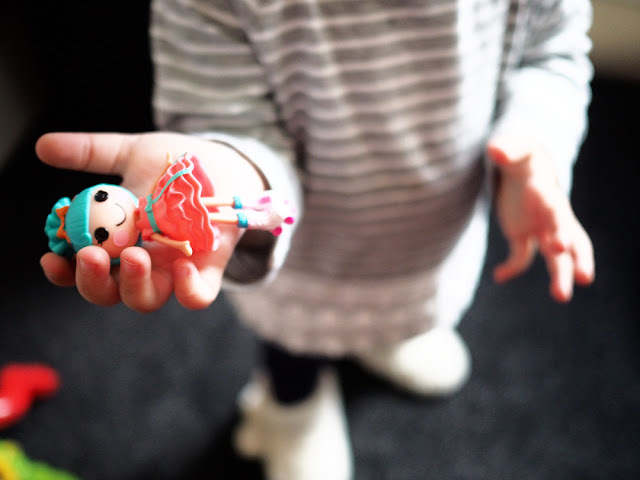 I let Lily hold a Lalaloopsy and she thought it was so cute. But they will be put away until she is a little older before she can play with them. On the box Lalaloopsy does say that its from 4 years old to 104! Which I can compleatly understand. I think its me who is the one addicted to these things and I could totally see myself forming a collection. Here is what I dressed the second Lalaloopsy in. I really can't wait to get my hands on more of these and to start to form a little collection for Lily to play with when she gets older. I get to do the fun collecting part and she can do the fun playing. Perfect! 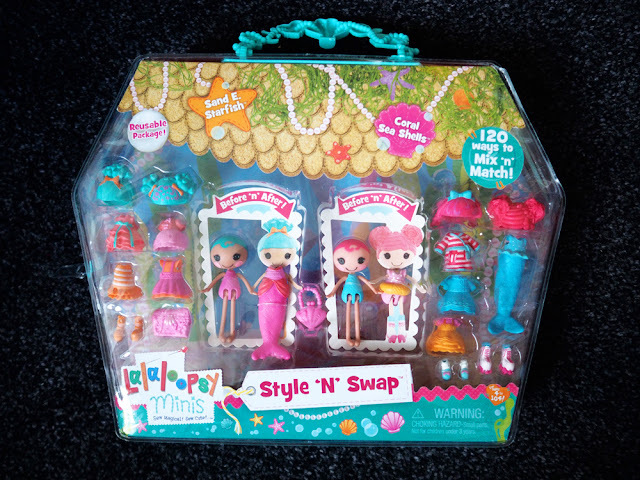 You can see more about Lalaloopsy here, Including where to buy them. Do you love Lalaloopsy? What would you dress your Lalaloopsy in? These are so cute, I wish that they were around when I was a little girl. definitely the mermaid! These are so cute such great toys! These look cute but we have not played with them yet, i love the big shoes on their thin legs!